Nothing tastes better, in the summer, than a nice juicy salad! With these beautiful summer days, we are trying to pack in as much fun as we can before it’s over. That means fast meals that fit the season. I am always trying to find new salads that my family will love and at the same time trying to find things that will keep my family healthy and staying away from fast food. Fast food is our down fall in the summer because we are running from one activity to another. This salad is delightful! It seriously can be your main dish and all you need is some crunchy bread sticks on the side and you have it made. Place the potatoes in a pot of salted water and bring to a boil. Cook until tender when you poke with a fork, it will be about 15 minutes. Drain potatoes in a colander and rinse them with cold water to stop them from cooking. Cook corn in a large pot for 5 to 7 minutes until tender but not soft. Remove corn and rinse with cold water. Cut potatoes into quarters and place in a large bowl. Cut the kernels off each ear. Add the kernels to the same bowl as the potatoes. Add the tomatoes, onion, and baby spinach. In a small bowl, combine olive oil, lemon juice, salt and pepper. Pour the mixture over the salad and toss! It's great to see you again after my very long blogging break! It looks like you ladies are still cooking delicious treats and I LOVE your new site (maybe it's not so new but I've been away for a while! )-It's gorgeous! I'm finally back and ready to get into blogging again. If you feel like joining another linky party I'm starting a new one! It's called Sundays Down Under and it will begin Saturday evening your time. I would be so thrilled if you could join in! Oh, that looks so yummy! 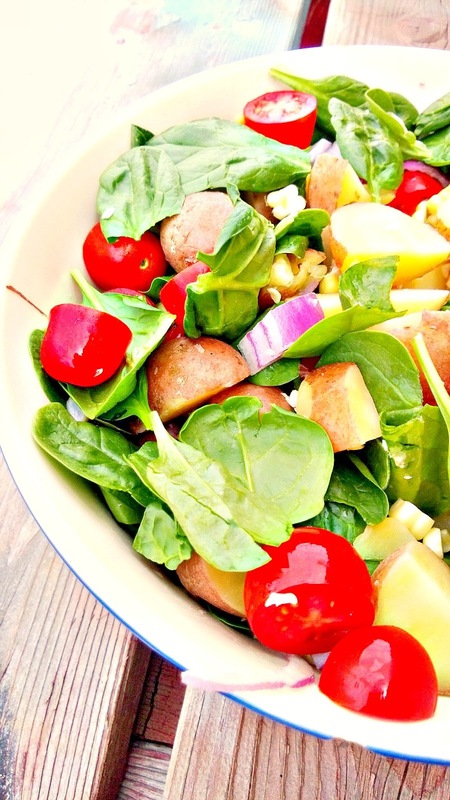 I never would have thought about potatoes in a salad, but it sounds great! Fantastic salad for summer time, although I'd eat it anytime!! YUM! I love changing up your normal salad for something a little bit more fun and this looks so good! Perfect for Summer! This looks SO good. I love tomatoes AND potatoes, what a perfect combo and I've never seen this together in a salad! Ooo…this looks amazing! So fresh and colorful! Perfect for summer! Thanks so much for taking the time to link up with us over at the #HomeMattersParty – we hope to see you again on Friday! This salad looks so yummy and perfect for summer! Thanks for sharing it with us at bloggers brags party! Pinned! Hope to see you again next Monday! This looks so yummy! A perfect summer time bbq side 🙂 pinning! I love a good salad and this looks so delicious!!! Thanks so much for linking up with Share The Wealth Sunday! Looks good! I would never have thought to combine potatoes with the salad greens. YUM. I have to admit, I'd add beets. LOVE beets in my salads. Thanks for linking with #TwinklyTuesday! 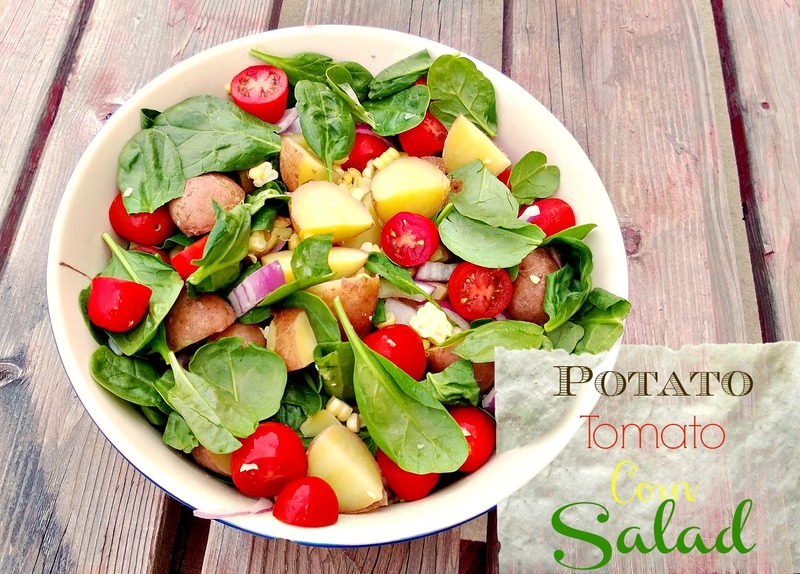 Potato tomato salad looks delicious and colorful, thanks for sharing with Hearth and soul blog hop. pinning and tweeting and sharing in google plus. What a beautiful salad! I love all the pretty colors…they make you want to just dive in! This sounds delicious and I will have to give it a try! Thank you so much for sharing at SYS and have a great week! This is such a hearty salad. I could eat it everyday! I love to include healthy, nutritious salads in my diet in a variety of ways and dishes, so I am delighted that you shared your wonderful Potato, Tomato, Corn Salad recipe with us on the Healthy Happy Green and Natural Party Blog Hop. I'm pinning and sharing. I love summer salads and this recipe looks awesome! Thanks so much for sharing your post with Full Plate Thursday and have a great day! Great salad! Thanks for joining Home Sweet Home! What a beautiful summer salad! Thanks for linking up and sharing with us at Funtastic Friday. Hope you stop by again this week.